If you are visiting the Island of Hawai’i, also known as the Big Island, a visit to Volcanoes National Park is a must. 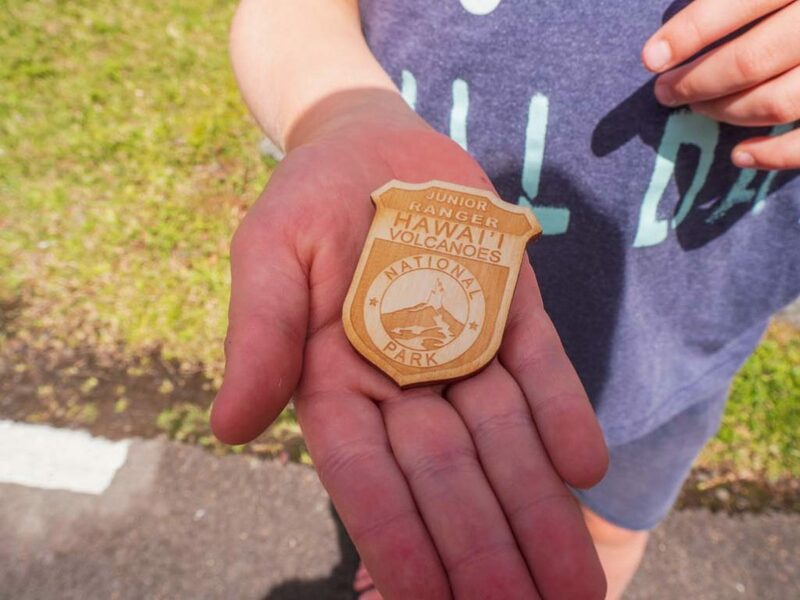 Volcanoes National Park is easy to visit with kids no matter where you are staying on Hawaii’s Big Island. 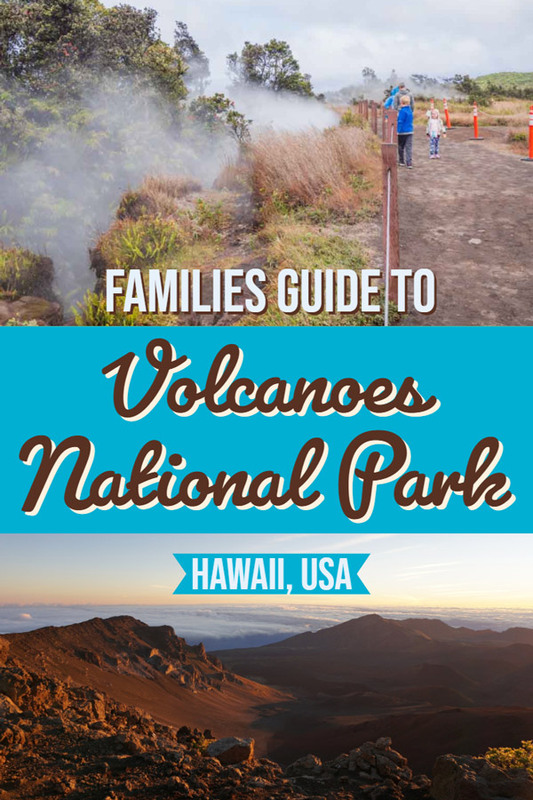 In this post you’ll find tips for visiting the Volcanoes Park, the best hikes with kids, the best family-friendly sights and attractions a to visit with kids as well as where to stay. 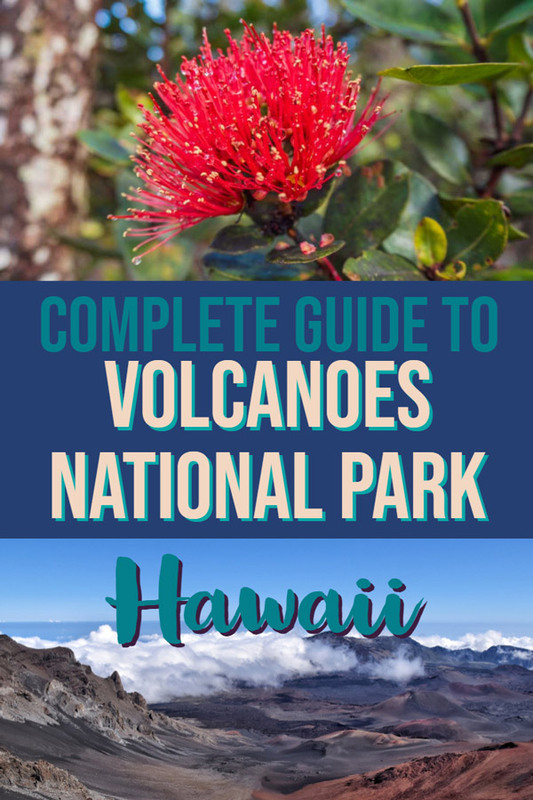 The information in this post will help you build a half day, one or two day itinerary so you can make the most of your visit to Hawaii Volcanoes National Park. Kilauea and Mauna Loa on the Big Island are 2 of the most active volcanoes in the world. Lava from these Volcanoes continues to add land to the Island of Hawai’i. If measured from the sea floor Mauna Loa is the highest mountain in the world, at 17, 000 m or 56,000 feet, this makes it over 8000 m (27 000 feet) taller than Mount Everest. In 2018 a new lava flow closed the park, much of the park is open again and at the current time of writing no Lava was visible above ground (the lava continues to flow but it is going via lava tubes out into the ocean). The lava flow can change on a daily basis, you can check for updates as well as for the different options on how visit the lava flow. 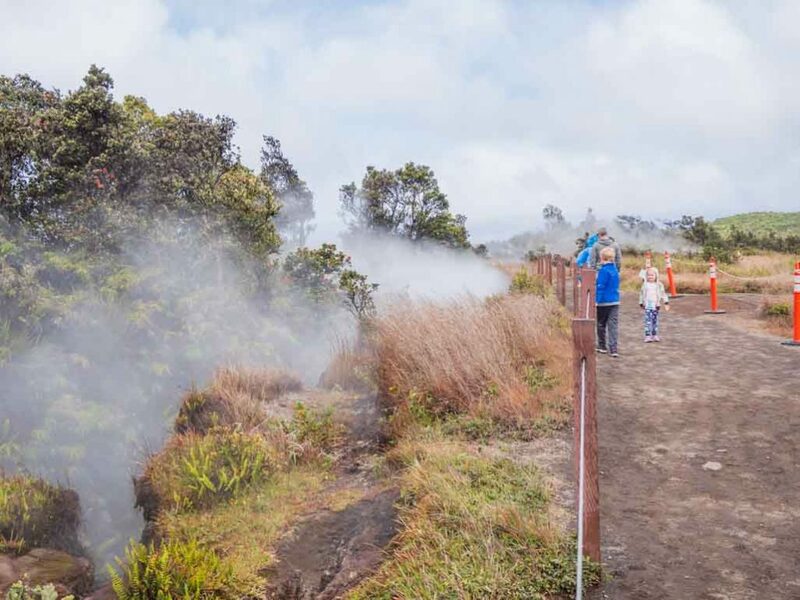 While seeing lava would have been an amazing experience for a family vacation there is still plenty of activity in the park to remind you that you are visiting an active Volcano. We come from another Volcanic Island in the Pacific and we were mesmerised and impressed by Volcano National Park in Hawaii. There are many accessible sites either via flat well paved pathways or near the road. It is cheap at only $25 for a private vehicle for 7 days this is very good value. 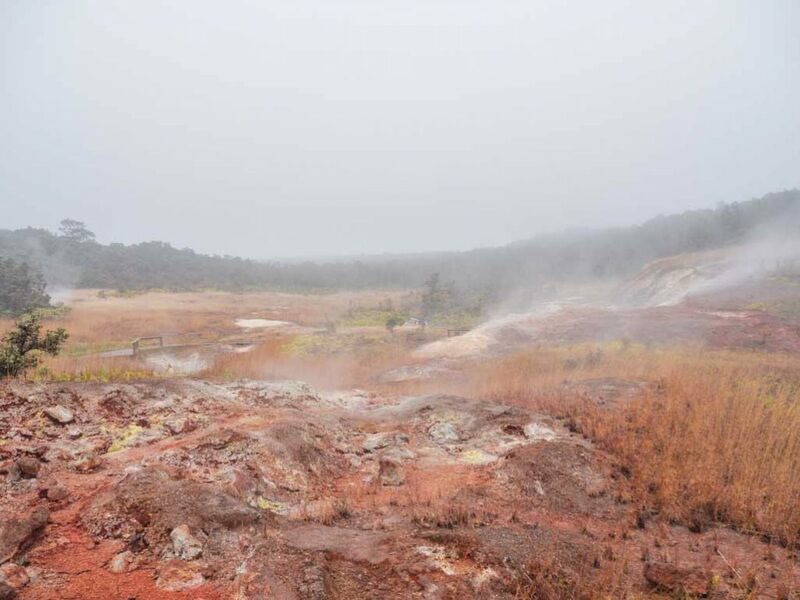 The park is a safe way to see Volcanic activity, Park Rangers and Geologists monitor the volcanic activity in the park. Be sure to stick to marked trails, don’t let kids wander off and obey all signs. Check for any safety updates. The variable terrain will keep kids engaged. Lush forest, steaming vents, black lava flows, birdlife and ocean views. The area is well sign posted and recommended itineraries for the amount of time you have make it easy to navigate the park without long drives or back tracking. Rangers are here to answer questions, suggest hikes and sites worth visiting. 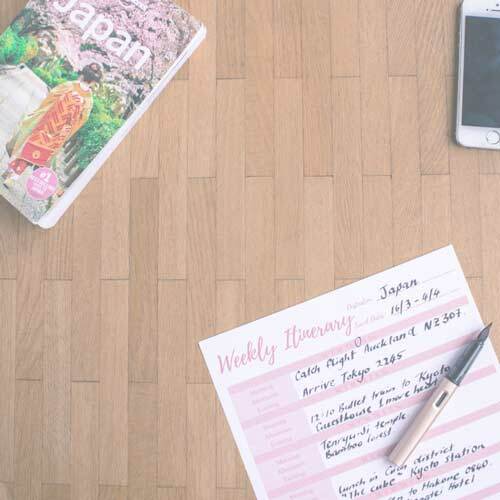 Suggested Itineraries are posted on boards suitable for visits for only a few hours to multiday itineraries. Pick up a Junior Ranger Pack for the kids, the first activity is done in the visitor centre. A series of questions that can be answered by exploring the displays on the flora, fauna, geography and history of the area. Be sure to watch the 8-minute video which explains how the landscape dramatically changed in 2018, destroying 700 homes and displacing more than 2000 people. 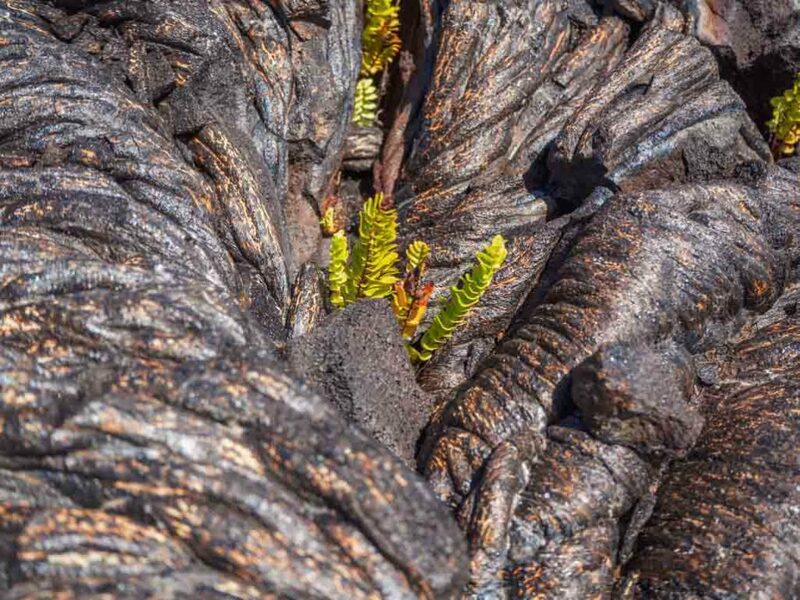 Take a moment to visit this gallery and see the beautiful artwork created by local artisans who have taken inspiration from the diverse landscape of Hawaii Volcanoes National Park. I’ll enjoy drinking my morning cuppa from a gorgeous mug purchased here for years to come. Head a little further past the Volcano Art Gallery and you will come to the Sulphur Banks Trail. This paved trail leads past steaming, yellow edged, sulphur pits. The distinctive rotten egg smell of Sulphur fills the air. Keep kids safe and don’t let them wander off the path. From the end of the Sulphur Banks Trail. 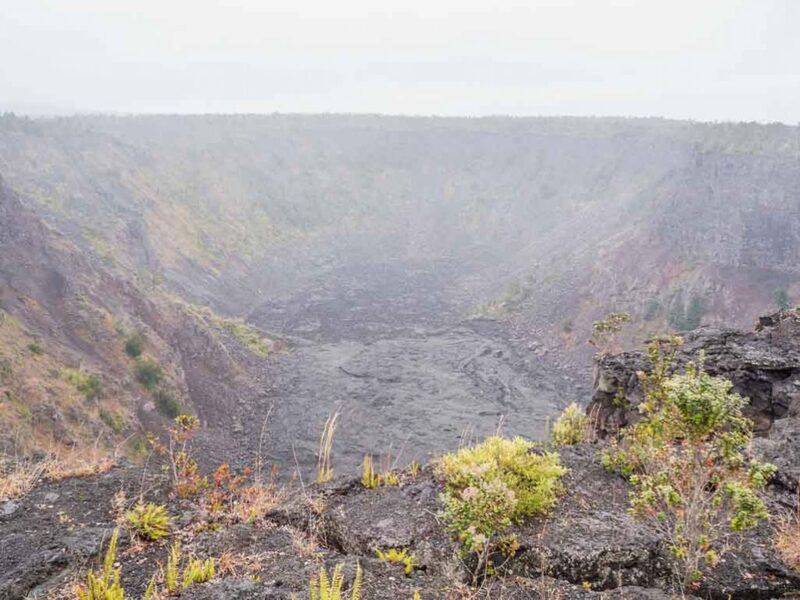 Cross the road to join the Crater Rim Trail or the Iliahi Trail to catch views of the Kilauea Caldera. 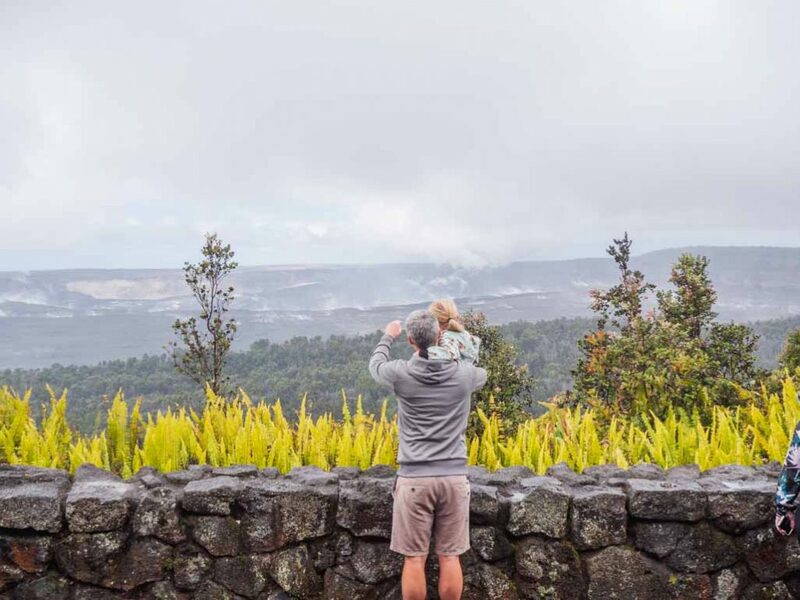 The other option is to walk back to the Visitor centre and cross the road to the Volcano House (a large red building), walk through the foyer and you will get a panoramic view of the Kilauea Caldera on the other side. Grab a coffee from the small kiosk and spend a few moments enjoying the large steaming crater. 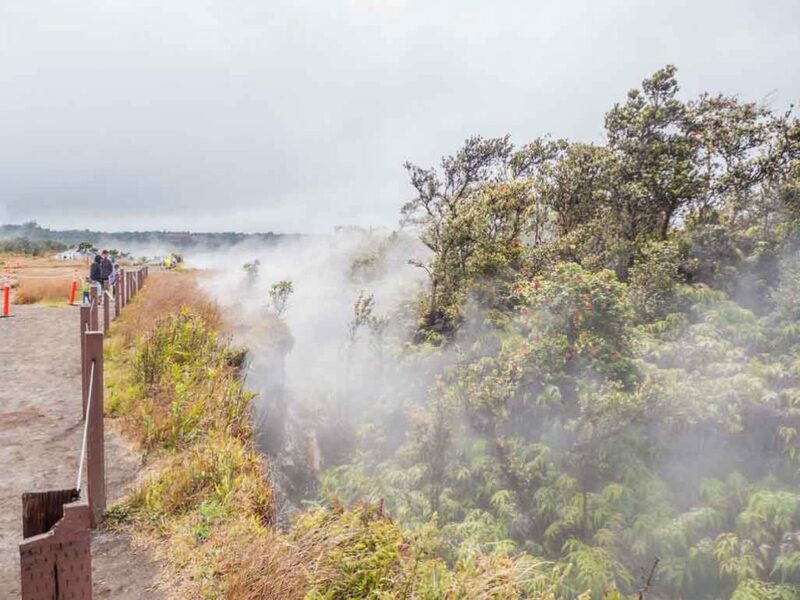 A mile up the Crater Rim Drive you’ll find the steam vents sitting on the cliffs overlooking the Kilauea Caldera, steam comes out from the depths like a warm blanket. 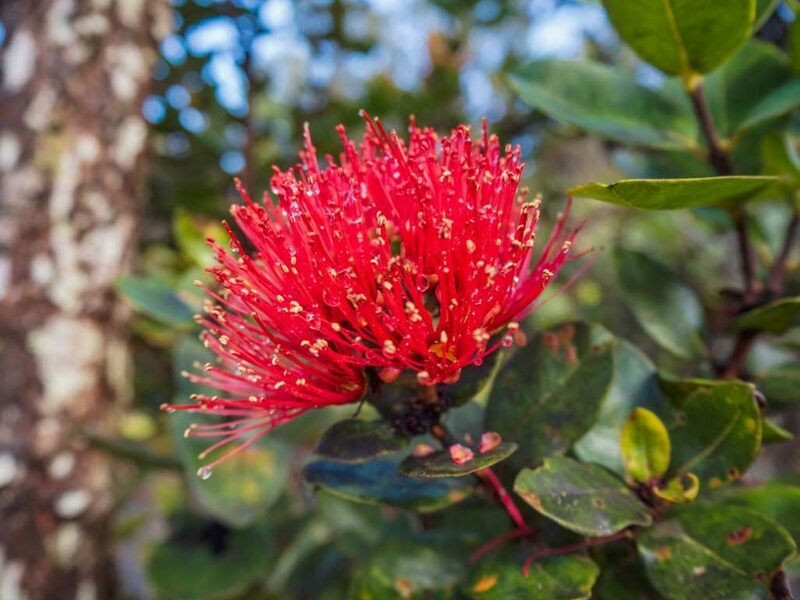 The ferns and Ohi’a lehua trees are incredibly robust to withstand such heat, in some areas it has gotten too hot and the foliage has charred but the plant still survives. Stop at the many view points along this road which heads down towards the coast. See many craters and lava flows of varying age. The hot magma that has flowed down the side of the Kilauea volcano looks as if has stopped mid movement, thick black ripples and waves of lava locked forever in black rock. Puahi Crater and Kealakomo platform are highlights. Further down the road the Pu’u Loa Petroglyphs (rock carvings) can be visited by a flat 2.3km (1.4 mile hike). At the bottom of the road (the rest of the road is now closed due to the new lava flow) is the Holei Sea Arch. 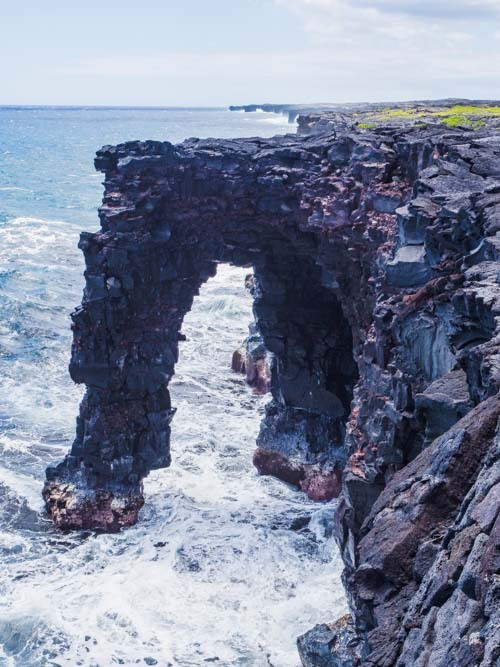 The destructive lava meets wild sea, the oceans brutal waves carve the lava into steep cliffs and have burrowed an archway on the cliff edge. The temperature down at sea level was much warmer than near the summit. This trail was recommended by a number of guidebooks but unfortunately the trail is closed and it may not open again in the future. Due to the recent volcanic activity in the park the Thurston Lava tube is closed, currently the only publicly accessible Lava Tube is the Kaumana Lava Tube, this tube is free to enter at the start of the saddle road near Hilo. You can also visit the Rainbow Falls while you are nearby. There are other Lava tubes on private land, some tour operators have access to these. Take a torch (cell phone torch will suffice) and covered shoes, I wore flip flops which weren’t ideal on the rough, sharp, uneven surface. The first part can be accessed without a torch, down a narrow staircase. Those with light can continue in for an adventure in the cave, you need to duck to get through a small section and then it opens into a larger cave. It is not a loop you exit via the same opening. Warm Clothing: Volcanoes National Park is over 1000m (3,500 feet) above sea level so the climate is quite different to down on the coast. Temperatures are always cooler than on the coast and with overnight lows of around 10 deg C (50 deg F) overnight to 20 deg C (68 deg F) during the day with little variation between summer and winter. We wore long pants and T-shirts with a fleece jacket and waterproof/windproof rain jacket over top. By the afternoon we were comfortable in the T-shirts and the rain had stopped. A hat and light scarf would have been a nice addition for our first hour in the morning but we were fine without. Sturdy shoes: The lava flows are sharp, uneven, unforgiving rock wear covered shoes to protect your feet and avoid any injuries. The area doesn’t get very muddy despite the rain but for those considering planning longer hikes waterproof hiking boots would be worthwhile. 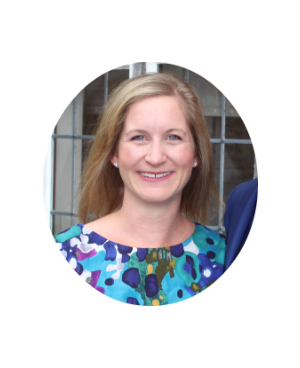 Sunscreen: The weather does warm up during the day and many walks have little shade. Wear sunscreen to avoid sunburn. Sunglasses and a wide brimmed sun hat with help to protect the delicate skin on the face. Mosquito repellent: We didn’t find insects a big problem on Hawaii but we did get some itchy bites. 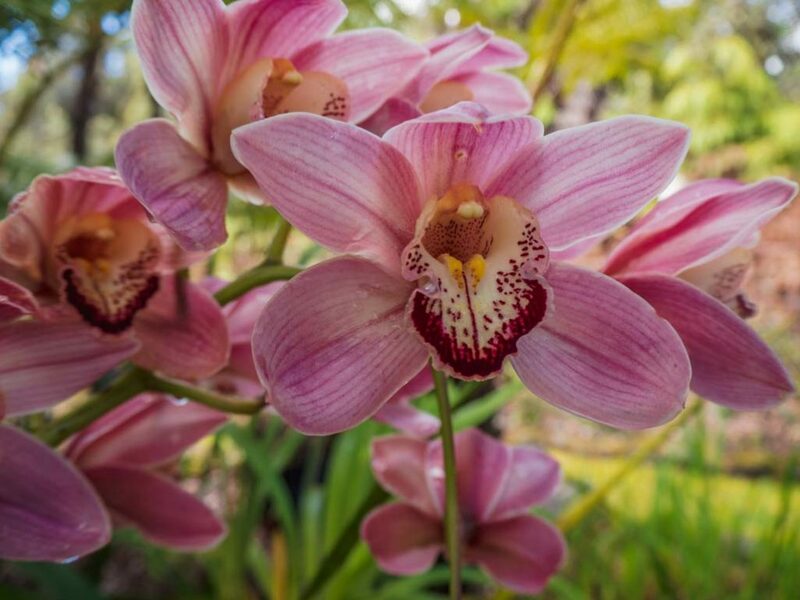 There is no risk of malaria, dengue or zika in Hawaii but these bites can be itchy and annoying. Hawaii requires the use of a reef safe sunscreen, read more about staying sun safe and protecting the ocean here. Water: Bring refillable water bottles and plenty of water. There are a couple of places in the park that you can refill bottles but they are few and far between. Food: There is only one restaurant in the park at Volcano House you can also buy some snack in the gift shop here and it is the only place in the park to buy a coffee. 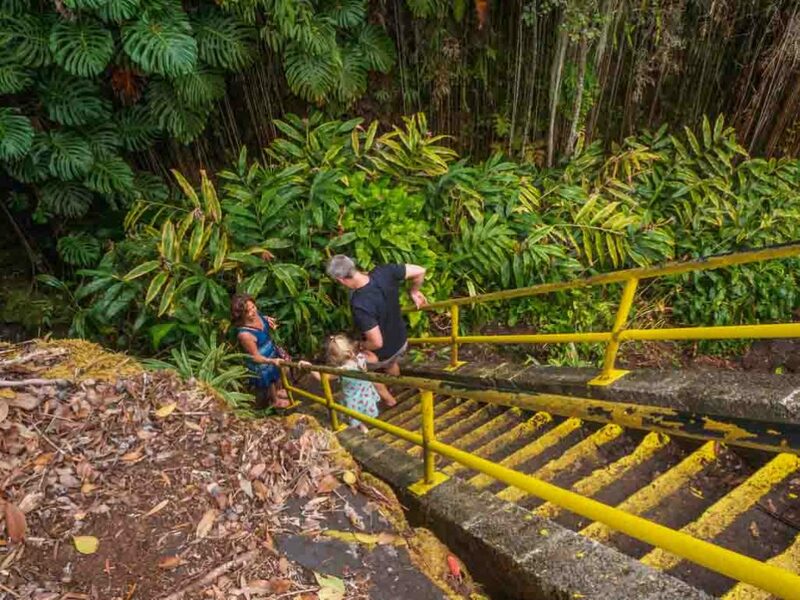 Bring your own snacks and a packed lunch (stock up in Hilo) or leave the park and eat in Volcano town, a 10 minute drive from the park entrance. Camera: If you travel with a camera other than your cell phone ensure you have spare batteries and an extra sim card. Consider bringing a rain cover or plastic bag to protect your gear. Small first aid kit: Have some band aids on hand for blisters and scrapes. Torch: If you are planning on visiting the Kaumana Lava Tube bring a torch or use your cell phone if it has this function. Paper Map: Much of the park doesn’t have cell phone reception, hold onto the map that you are given when you pay your entry fee or pick one up at the visitor centre. Another option is to download the offline google map. When visiting Volcanoes National Park our family staying in a private vacation rental. We booked the Ohia Plantation House directly with the owners. There are also hotels and many vacation rentals listed on VRBO. The advantage of staying in Volcano is that you are only minutes away from the park and can return to your home base for lunch or a break in the afternoon. The weather in Volcano is much cooler than on the coast so many houses have fireplaces and even hot tubs. We loved this aspect and spent evenings in the hot tub drinking wine and slept so well in the cooler, fresh temperatures. Hilo is the closest major centre to Volcanoes National Park. Hilo is on the coast at sea level so you will get the balmy Hawaii temperatures. 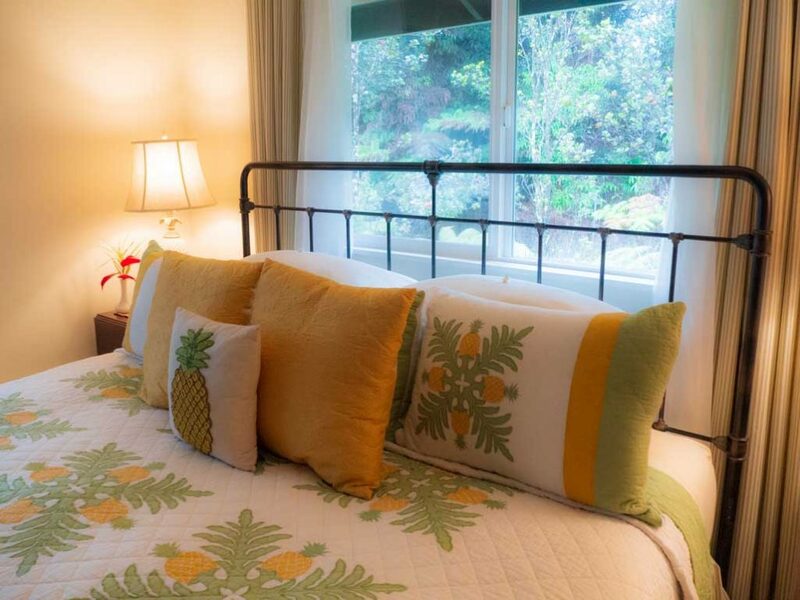 There are a lot of accommodation options in Hilo as well as supermarkets, shopping malls and plenty of restaurants. The drive from Hilo to Volcano takes approximately 40 mins. Visiting Volcanoes National Park from around the Big Island. It is possible to visit the National Park from nearly anywhere on the Island as a day trip. The saddle road that crosses the Island from East to West once had a very bad reputation. In recent years the road has been upgraded. The road is now wide, smooth and mostly straight. It is a pleasure to drive through interesting landscape. Want to see more volcanic destinations check out these posts on Lanzarote, Iceland and New Plymouth. USA National Park lovers check out this post on Acadia National Park.